Elbow pasta with creamy cheese sauce, premium seasonings & bacon bits. 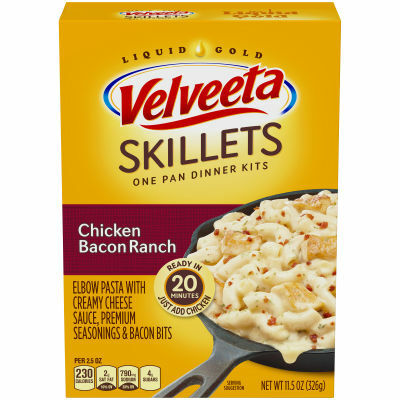 Satisfy your taste buds with great-tasting Velveeta Cheesy Skillets. Made with rich and creamy Velveeta cheese sauce--it's liquid gold! Serving size 2.5 oz (70g/ about 1/5 package) (makes about 1 cup).